Continuing with the informative tradition of the Fabra Observatory, we present the new 2019 spring courses for scientific dissemination that will begin the last week of March, which will allow us to deepen our knowledge of those fields that are most interesting to us. 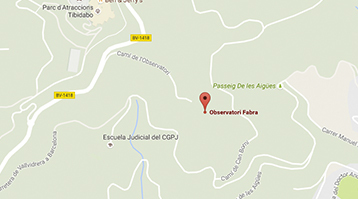 An introduction to the fundamentals of meteorology and climatology, exploring the Fabra Observatory and the use of its main instruments. As a continuation of the previous course, this time we will go further to know the atmospheric thermodynamics, the influence of man in the atmosphere and the urban climate, the remote sensing systems in meteorology, the antroponuvols and the meteorological phenomena related to severe weather. A detailed study of our Universe, our galaxy, stars and our Solar System. A review of the visual observation of the sky and the different celestial phenomena, with keys for the management and purchase of instruments for observation. You can give the Spring Courses through our Gift Vouchers.